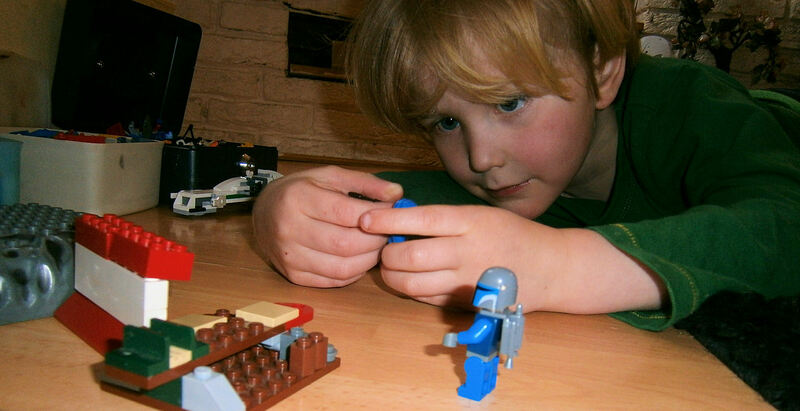 Toys and activities are a massive part of my life and have been for the past 10 years, when you become a mum you start seeing lots of bright coloured toys and amazing character playsets and before you know it your house fills up and can rival the best toyshop. But what really do children like to play with? what actually keeps them entertained? We have just about tried out every style of toy imaginable, and we really enjoy playing with them all, my boys are happiest with their figures and playsets. My ten year old will still play with his star wars figures and lego is a constant hit, dressing up outfits always been hugely popular here for my boys too, in fact my boys will entertain themselves with pretty much any toy and there are very few things which get left unloved, Chloe however is much harder to please. I'm not sure if its because there is only one girl and so she has no one to play with like her brothers do when they both grab hand fulls of power ranger figures or sit and transform Optimus Prime from truck to Robot whilst defending off the goblins attacking the castle together chattering away in their imaginary worlds, or if its just the way girls are. Chloe has never really been very toy oriented, she has a box full of littlest pet shop figures which get left untouched, Zhu Zhu hamsters and grooming salon playsets which have only been taken out of their boxes a couple of times, a massive collection of Sylvanian families which I adored as a child and can still happily spend hours sorting out and setting up, but Chloe isn't interested in them, or the Bratz, Build a Bears or any number of other toys we always end up piling into the back of her wardrobe. So what do tween girls play with? If Chloe is anything to go by then art and craft stuff is the only thing which she actually comes too time and time again, she is happiest with a pad of paper some coloured pens and some stickers, infact anything crafty will get her time and attention over and over again. We always have glitter glue and pom poms and googly eyes galore but the problem with this is that there is often not a very useful outcome to Chloes efforts. 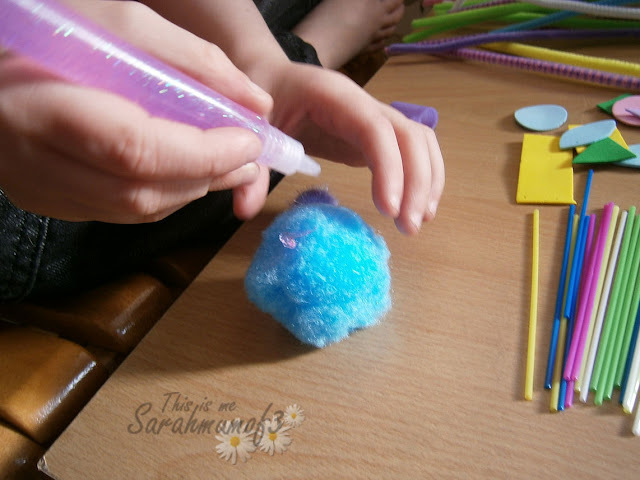 and when the outcome is poor Chloe is frustrated, we get sticky pompoms and pipe cleaners poking out all over the house and it gets sweeped up and piled together as the ever growing pile of clutter. 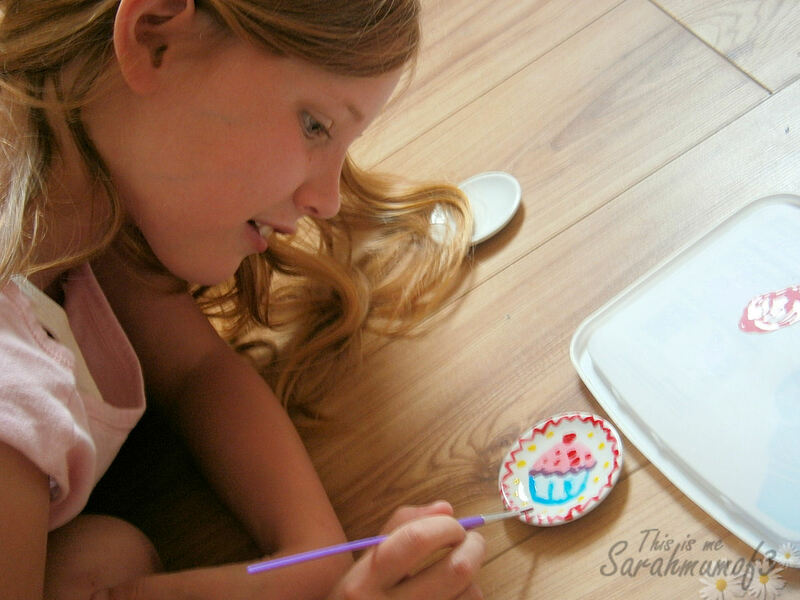 But when crafts are the one thing that holds your childs attention the best way to keep them happy is by buying a craft kit, and there are loads of craft kits available. Last week we were sent the Japanese Doll Kit to review, and this went down a treat, keeping Chloe entertained for several days as she painted one doll at a time and then wrote the notes and messages to match. The end outcome was lovely and could be proudly displayed (not like the scrunched up pipe cleaner covered pom poms!) Another great kit was the My Clippy Bags of style set, again this was easy for Chloe to do herself kept her entertained for a while and the end result was worth keeping. 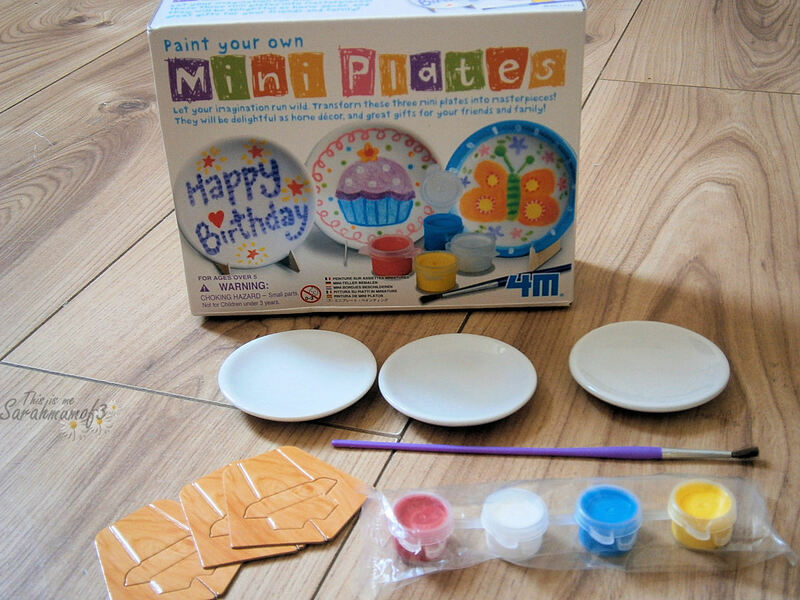 This week we have been sent a mini plate decorating craft kit by 4m to review. It is a lovely little kit and exactly the sort of thing that really grabs Chloes attention. 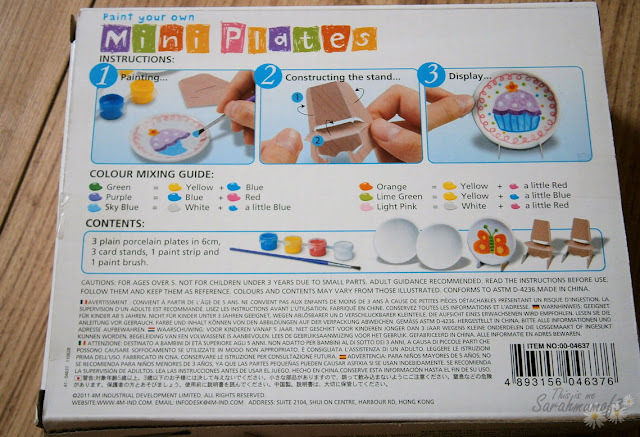 The box is small but pretty with pastel coloured designs on the front, upon opening the box your met with three little porcelain plates (approx 6cm diameter) 4 tubs of paint a paintbrush and three cardboard stands. Chloe initially was slightly disheartened by the size of the plates, saying there tiny! but this didn't stop her enjoying the kit. The four colour pots of paints you receive are red, yellow, blue and white. and on the back of the box it gives you a mixing guide which is a nice touch and Chloe enjoyed mixing some colours. The paint painted well onto the plates and Chloe copied the design from the box with the cupcake first. She was eager to complete the plate and was a little hasty with the layers of paint she could have got a better finish with a little patience waiting for the paint to dry before adding some of the detail. 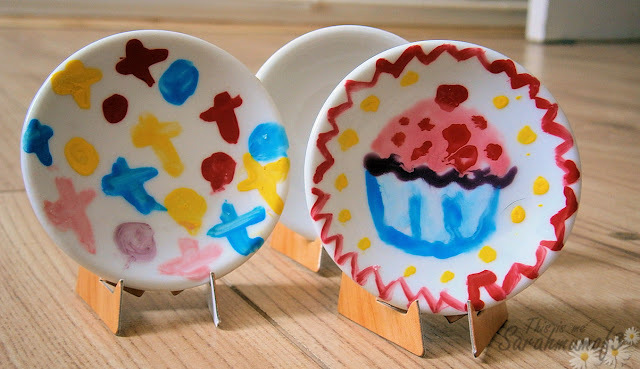 The paper stands are great for display purposes and Chloe was really pleased with the end outcome, she then went on to paint a second plate with a simpler design and she has kept the third plate for the time being to design for her next friends birthday present. The kit kept her happily entertained for a good hour and there is still a third plate to paint which is great as she is doodling designs for this one on paper before she jumps straight in to paint it. Overall she loved this kit and I would happily purchase it again for her or any of her friends and with it priced around £5.99 from Amazon it really would be a great birthday gift or activity to have to entertain over the summer holidays. There are other great kits in the 4m Range including a make your own jigsaw kit which looks great too, I will be looking out for some more kits for Chloe birthday next month. oh yes Play maize we haven't got any of that but I have seen it and Chloe loves things like that too we had some play foam last year which was great and she still loves playdough too!